Children who eat a balanced diet tend to eat a healthy diet. But food alone does not a healthy diet make. Your feeding style also plays an important role. As a childhood nutrition expert, this is where I see many parents getting tripped up. You focus on one or two healthy foods instead of an overall balanced diet. Or, you worry more about what to take away from your child’s diet, rather than what to include in it. Is this you? If so, this article will help you take a more effective approach in planning balanced meals and feeding your child. In this article, I’ll cover what a balanced meal is, why it matters, specific food groups to include as part of a balanced diet, as well as portion sizes for kids and timing of meals and snacks. What is a Balanced Meal Plan? You may be striving for a balanced, healthy meal plan, but if you don’t have the basics in mind, you may question yourself. Let’s get the concept of healthy meal plans straight. Together, a balanced diet and optimal meal timing will create a healthy meal plan for your child. As a result, she will be better able to grow and regulate her eating. Why Does a Balanced Diet Matter? There are several reasons why a healthy eating plan is important for growing children. First, offering a balanced diet of different foods ensures your child will receive the vast majority of his nutritional requirements for growth. Secondly, the timing of meals and snacks help cover your child’s hunger and appetite so that she’s better able to regulate her eating. In the end, a healthy meal plan helps your child meet nutrient requirements while eating in a more intuitive and mindful manner. That means eating for hunger rather than boredom, emotions, or other outside triggers. Food groups are the categories of food that target important, specific nutrients. There are five main food groups, which I will describe below. Fats are an additional food group, but many foods already have fat included, so I generally don’t ask you to work this in, unless I feel there isn’t enough in your child’s usual eating patterns. Fun Foods are a group I add to the mix so that you can explore the right balance of nutritious foods and indulgent foods. The fruit group and vegetable group (for brevity, placed together) target potassium, vitamins A and C, and fiber, among other nutrients. The protein group covers iron, zinc, vitamin B12 and more. The dairy group covers calcium, vitamin D, and potassium. The grains group offer other important nutrients such as B vitamins and fiber. The more food groups you include in a meal, the better chance your child gets an optimal variety of nutrients. I teach my families to set up healthy meal plans using the five basic food groups, starting with protein first. Protein is important for growth in children and for appetite control, so I like to see it take a starring role on the meal plan. The protein food can be beef, poultry, fish, eggs, beans, soy, or it can be something from the dairy group (also a good source of protein) like milk or yogurt. Second, pick fruit and vegetables. Yes, I like to see fruit on the table at all major meals. Fruit takes the pressure off of eating veggies if you have a hesitant eater. It’s also a great source of nutrients, and if your child has a sweet tooth, is a good stand in for dessert. Lastly, fill in the meal plan with (whole) grains and dairy (if it hasn’t been added yet). Include all the food groups for a balanced nutrition plan and a healthy diet for your child. What about Portion Sizes in a Balanced Diet? I believe that the table is where kids learn about portion sizes. I also believe that children should be allowed to eat to satisfy their appetite. These two goals: learning about portions and eating to satisfaction (instead of fullness) can clash at the family table. You never want portion sizes to become a restrictive way to feed your child. That’s why I like to use the concept of starter portions. What is a Starter Portion of Food for Kids? Starter portions are age-appropriate portion sizes for your child. They help your child understand a good place to start with how much food to eat, while also understanding that more food, if hungry, is okay to have. Let me repeat: Your child should be allowed to eat an array of food groups at mealtime, in amounts that satisfy her appetite. Starter portions are simply a place to begin with food amounts. Starter portions teach a point of reference for kids. Think of them as a visual learning tool. Without them, kids may not understand what a normal portion size looks like, or may over-serve (or be over-served) food portions. As kids grow, the starter portions change to accommodate their bigger bodies and growth requirements. See my free chart to help you better understand starter portions. I like to see kids experimenting with measuring cups and spoons and other simple tools to help them learn. Who says your child can’t use a half-cup measure to serve up rice at the table? What is the Best Timing for Meals? The timing of meals is key, too. In fact, this can work for you, or against you. Get the timing right, and your child will be satisfied after eating and less likely to ask for more food afterward. If you get the timing wrong, your child may be hungry, asking for snacks, and potentially grazing with or without your permission. I base my meal timing recommendations on basic physiology. A child’s tummy is smaller. Because of the smaller size, children eat smaller volumes of food more frequently. For instance, a toddler has a very little tummy, so I recommend setting up meal timing every 2 to 3 hours. Translated: a meal or snack should be scheduled every 2 to 3 hours throughout the day. This will help to meet nutritional needs while covering hunger and appetite. The school-age child should have a meal plan that reflects a 3 to 4 hour window between meals and snacks. Teens do well with meal timing scheduled every 3 to 5 hours, depending on growth spurt, activities and overall daily life events. I think meal timing is critical to helping your child regulate his eating. In other words, helping him eat the right amount of foods to satisfy his appetite. I see kids go too long without eating and experience the sensation of being overly hungry. You know where that can lead. Or, I see the child who is eating frequently throughout the day and getting too much food, and never really experiencing hunger and appetite. Meal timing (and the supportive kitchen boundaries you need to back you up) can help tame these eating extremes. A balanced meal plan for your child will include a variety of food groups, starter portions, and optimal meal timing based on your child’s age. This three prong approach will help you create a healthy nutrition plan for your child, while teaching him how to balance food and encourage self-regulation with eating. How do you create balanced meals for your family? Need More Help with Nutrition? 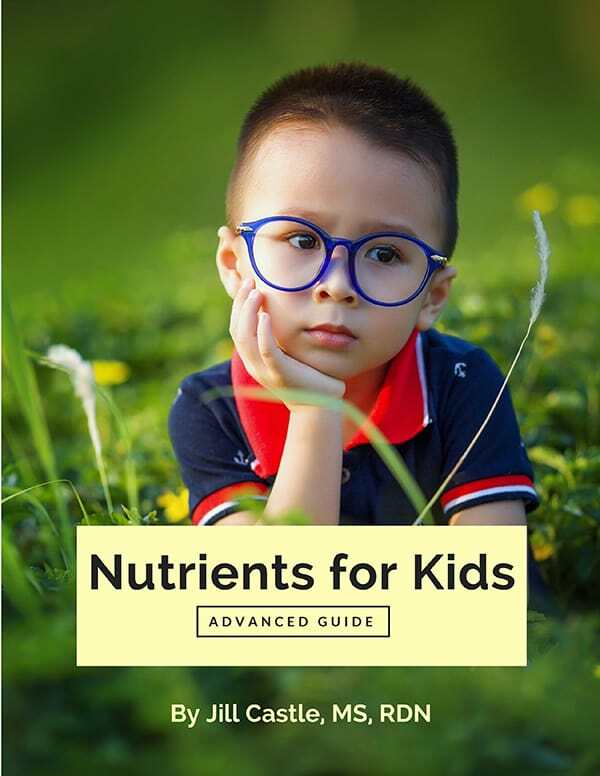 If you’ve got a sneaky suspicion you’re missing food groups or nutrients in your child’s diet, my e-book, Nutrients for Kids, Advanced Guide, can help you sort this out. In this guide, you’ll get my Top 7 Nutrients you need to watch for, along with nutrient sources of foods, substitutions if you need them, and guidelines on when to bring a multivitamin on board. Additionally, my program The Nourished Child Project takes you through the basics of food, feeding and setting up healthy habits for your child.